The Disney Magic Kingdom hotels offer luxury and an unrivaled location for those wanting to stay near The Most Magical Place on Earth. The Magic Kingdom hotels are all in the category of Walt Disney World deluxe resorts. Here are the Disney World hotels closest to Magic Kingdom. Most are on the monorail system with the exception of Disney’s Wilderness Lodge. This is accessed by boat or bus transportation to the park. 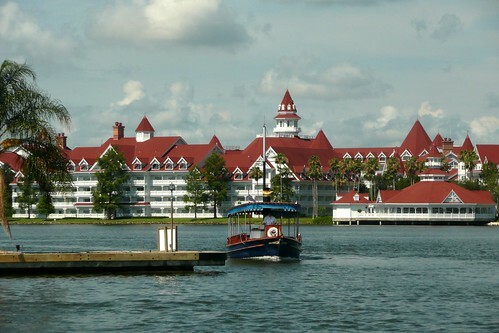 The Grand Floridian Hotel Resort and Spa is most luxurious of the Disney Magic Kingdom hotels. It is also the most expensive! This is Disney’s flagship deluxe resort. If you are looking for the best location, largest rooms, fabulous swimming pools, recreation, dining and even a spa then this could be the resort for you. 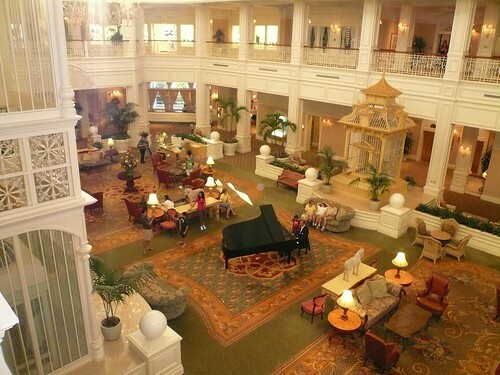 The huge lobby of the Grand Floridian is the very picture of elegance and relaxation. However, you will feel at home here dressed in a dinner jacket or shorts and a Mickey Mouse hat. The Magic Kingdom is easily accessed from the Grand Floridian by the monorail or the resort boat. You can be in Disney’s Magic Kingdom park in minutes. Very convenient for visiting the park in the morning, coming back to the hotel for a short rest and then heading back out in the evening. If is also very easy to access Epcot from any of the Disney Magic Kingdom hotels. Travel to the Transport and Ticket Center on the monorail and then catch another monorail to Epcot. All other parks are accessed on the Disney bus transportation system from the Magic Kingdom resorts. A very unique Magic Kingdom hotel. The Contemporary Resort actually has the monorail run right through the lobby area. You can’t get much more convenient than this as the monorail will transport you in minutes to the Magic Kingdom. Disney’s Contemporary Resort has 2 distinct sections. The Tower building with the monorail running through it, the main lobby and the restaurants. The separate building is the Garden Wing. Different view options are offered including of course the most coveted (and expensive) Disney Magic Kingdom view. The Bay Lake Tower at Disney’s Contemporary Resort is part of the Disney Vacation Club and offers studio, one, two and three bedroom villas. However, these can be booked by anyone. You do not have to be a Disney Vacation Club owner. Rates start at around $450 per night for a studio right up to around $2000 a night for a 3 bed villa. 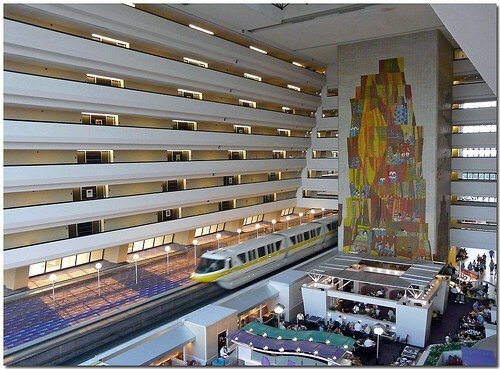 For more details here is a Disney Contemporary Resort guide. If you are looking for a tropical resort paradise just minutes from Magic Kingdom then the Disney Polynesian Hotel is a great choice. The rooms are among the largest of any Disney resort including the Grand Floridian. There are lots of view choices including some Magic Kingdom views. 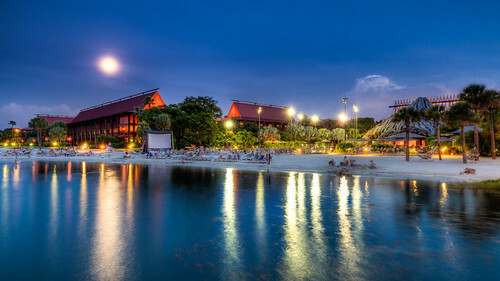 There are some good dining choices and the Disney Polynesian Resort hotel is home to the very popular dinner show Spirit of Aloha Polynesian Luau. The Magic Kingdom is easily reached from the Polynesian Hotel by either monorail or boat. 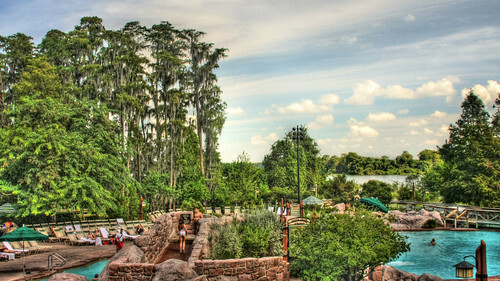 Walt Disney’s Wilderness Lodge Resort is not part of the monorail system, but has easy access to the Magic Kingdom by bus and boat. 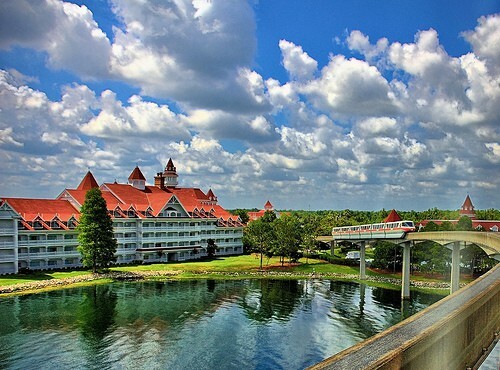 The resort is one of the most stunning architecturally of all the Disney hotels. Step into the lobby and you step into a different world – far removed from the crowds of the theme parks. 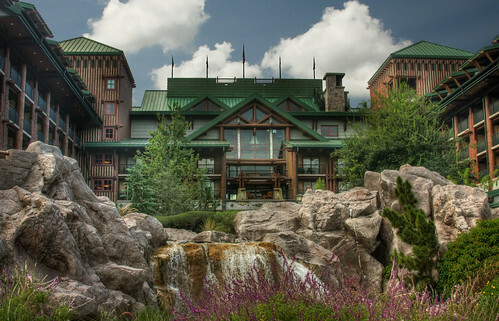 This deluxe Walt Disney World resort takes it’s inspiration from the Old Faithful Lodge in Yellowstone National Park. It is truly stunning. Guests can choose between the hotel rooms of the resort or the larger Disney Wilderness Resort Villas. At a standard 340 square feet the rooms at Wilderness Lodge are a little on the small side. Therefore, if this is a consideration you should look to one of the other Magic Kingdom hotels. 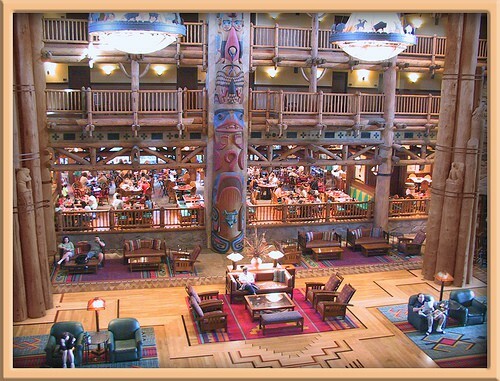 The Wilderness Lodge has some great dining choices including the highly regarded Artist Point. If you are looking for a very relaxing atmosphere and beautiful surroundings then you should consider Disney Wilderness Lodge. All of the Disney Magic Kingdom hotels offer easy access to the park. Unlike non Magic Kingdom resort guests, you do not have to go though the Transport and Ticket Center so you save a great deal of time in your journey to and from the park. This collection of deluxe hotels is among the finest in Walt Disney World – so the most difficult thing is choosing which one is best for you.